Trevor – This one wasn’t even on my radar, but at first glance it’s looking quite interesting. I’m digging the old world set that we’re seeing, the lightning balloons and hovering electrical lines make this look cool. I also like that we have a criminal investigation of sorts going on. It also looks like we may be seeing a performance from Daniel Radcliffe that doesn’t make me cringe. I’m hopeful for this one; I hope it turns out to be good. Tim – I was pleasantly surprised by this trailer. I had heard that this was Radcliffe’s next project but instantly forgot that fact. I like that it’s a more “realistic” take on the Frankenstein story, but not too slavish too reality. Dr. Frankenstein seems a little off (as expected), but I really like that Radcliffe’s Igor isn’t a bumbling hunchback. The actual piecing of body parts together is unnerving and cool. 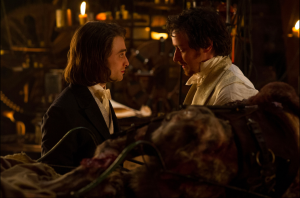 And McAvoy and Radcliffe are great leads. Trevor – Normally westerns aren’t my favorite. I’m struggling with where I land on this one for sure; it’s got a cast that I like and the images are very clean and appealing. They look quite different than most shows I see, they seem so clean and simple. But I like that in photography, so I’m finding the visuals cool. It’s calm, but clearly there’s a wild and wacky storm brewing between the group. I’m curious enough that I just might end up watching this one. Tim – I’m really excited for this one. I’m pretty hot and cold on Tarantino movies, but the great ones are pretty darn great. This looks like Reservoir Dogs and an old spaghetti western made a baby. And it has a stellar cast- Samuel L. Jackson, Kurt Russell, Tim Roth, Bruce Dern, and a ton of other great actors. I like that it seems to strike a good balance between tense suspense and humor, and it’s not a big shoot-em-up. I’m in. Trevor – “Deadpool” is Deadpool. Lol. It’s going to be graphically violent and seems (based on the red band trailer) like it will be a pretty hard R. That usually means I won’t watch. But I like the humor and feel of this trailer. So I guess we’ll see where life goes. Tim – This trailer wasn’t really new this week, but we hadn’t talked about it before, so I felt obligated to include it. I have mixed feelings. On the one hand, I’m glad that Deadpool fans are finally getting a movie that seems to do the character justice, and I’m glad that it’s rated R so that it fits the true tone of the property. Also, in a world of superhero movies that are all very similar (great in most cases, especially the Marvel-proper movies, but still very similar in a lot of ways), it’s nice to see a superhero movie that reaches a different audience. However, I just don’t love Deadpool. His constant banter really gets on my nerves. It’s funny for a minute, and then I just want to mute him. So…. we’ll see. Trevor – All this trailer does to me is scream bad CGI. It’s so fake looking it’s like we’re not even watching anything remotely real. How do I suspend my disbelief of reality if what I’m looking at does not seem remotely plausible. The cast brings next to nothing for me, there is Vin Diesel… but that’s the only thing that I care about and I feel like he’s the same in everything he does, so why should I watch this hyper fake version of reality for a story I won’t even believe. Granted, the plot sounds interesting, but I’ll be you a dollar I never watch this one. Tim – I’m mildly interested in this movie, but with full knowledge that it’s probably going to be cheesy. It’s Vin Diesel, though! C’mon, he’s just cool. I like the premise of the movie, and it looks like it would be a great video game. I just don’t know if that translates to a good movie. I’m not holding my breath. Probably a rental.